Could bamboo composites forge a path for a sustainable automobile industry? An interview with Ivan Platas Martínez. An automotive engineer with 20 years of experience, Martínez is now leading a start-up, ‘GOYTI’, which is developing electric urban vehicles made out of sustainable materials—including bamboo. It is great to hear from someone in the automotive industry who is so enthusiastic about bamboo. How did your interest in bamboo develop? We [Martínez and Karl Niklass, who co-founded GOYTI] have been working in the automotive and motorsports industries for more than 30 years. We have worked for Formula 1, Le Mans, the World Series by Renault, Mercedes-Benz and SEAT… After more than 10 years working together we decided to create a new urban vehicle concept: replacing polluting finite materials with renewable ones. A lot of the materials used to produce automobiles are not sustainable. Another problem is that current vehicles are very heavy, and a lot of vehicles are far bigger than the actual space required by people—for example, people who drive alone. This made us think about alternative vehicle designs, and also about alternative materials that are sustainable, light and strong. A few years ago we started to work on a project to develop lightweight, efficient electric cars for the urban environment. For their construction we use sustainable materials, with bamboo playing a crucial role. The key advantages of bamboo are its rapid growth; the fact that it helps capture a lot of CO2 from the atmosphere; and its very light weight. Bamboo also has a superb strength to weight ratio, which makes it a very interesting resource. How were you able to integrate bamboo into your work so far? 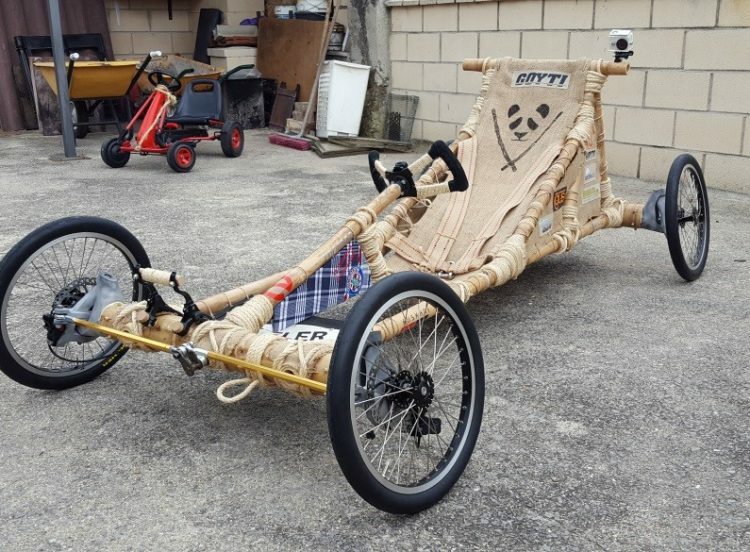 As part of our research to learn about bamboo—their species, properties, origins and suppliers—we decided to challenge ourselves by using this material to construct the world’s first bamboo soapbox racer (pictured above). For the car’s construction we used Guadua baboo from Colombia. The flexibility of the material along a clever chassis design allows the vehicle to drive around corners with up to 40 km/h without any wheel being lifted off the ground. Thanks to the lightness of the material and the simplicity of the design, it weighed only 22 kilograms. This project was a lot of fun and important for learning, but of course the vehicles we are looking at will use a modern design and not the construction techniques seen with this ‘Flintstone’-style racer. We are unlike the motorsports or aeronautical industries, which use unsustainable composites like carbon fibre and aluminum for assemblage; we are looking at using lightweight, sustainable materials to build composites. At the moment we are investigating the use of balsa wood for the core and laminated bamboo or birch plywood for the exterior, or a combination of both. So far, we’ve constructed prototype components and we are testing them in certified laboratories. The construction techniques and technologies which are available nowadays mean we are able to construct both flat and curved shapes. Bamboo’s flexibility provides us with a suitable solution for the construction of many vehicle components. How far are you in the process for using bamboo? At the moment we are focusing on testing these composite solutions for their strength, durability, insulation, crash worthiness and weight. We are also testing their durability and resistance to water, moisture and fire. Our aim is to have this composite construction certified, which would allow us to move forward towards making lightweight vehicles that use bamboo. Making bamboo a standard for eco-composite constructions would also promote it as a sustainable alternative to aluminium, steel and plastics while aligning with the European Circular Economy Plan and the [UN Sustainable Development] Agenda 2030. What challenges did you encounter when you began introducing bamboo into the automotive industry? Regarding the development process, a key challenge was finding the right species. 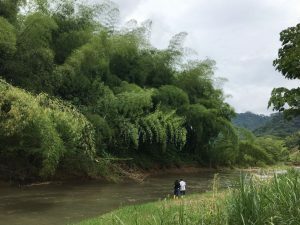 Since there are around 1600 different species of bamboo, each of which has different properties and applications, identifying the correct species required a lot of research. For the construction of some structural components and in some parts of the bodywork, we need the power fibres [particularly strong fibres that run parallel to the stems] from the bamboo culms. We are using veneers and laminated plates from different species such as from Moso or Guadua bamboo. For other components where strength is not a key factor, such as in cosmetic parts, we are open to using other species, such as ‘tiger bamboo’ from Japan. 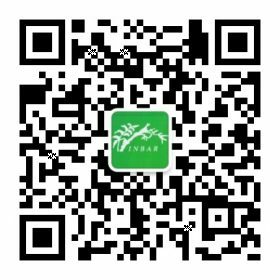 What we like about [tiger bamboo] is its very beautiful appearance. As well as learning about different species, we also had to learn about the techniques involved in transforming grass or wood into usable products [such as joining techniques, lamination and bending processes]. This was difficult at first, because we all come from a traditional automotive industry. Fortunately, we are all so enthusiastic about bamboo, wood and other natural resources that we are learning rapidly. Were you able to identify any advantages of bamboo in terms of resource or energy efficiency? Fast-growing and strong, Guadua bamboo is common to many countries in Central and South America. By researching different techniques and available machinery [for processing bamboo] in the market, we quickly realised that the manufacturing process would be relatively simple and inexpensive. In addition, we recognised that the whole construction process requires much less energy than that used in the conventional automotive industry in which big presses, rolling benches, robots and welders are required. However, the carbon footprint still has to be analysed. This should take into account all the factors involved: materials, land use, preservation, processes and energy. If we can optimise these processes and develop safe, efficient mobility solutions, we will all be closer to a real ecological transition. How important do you think partnership is in this process? We view partnership as very important. However, finding the right partners can be very difficult when you are starting out. The World Congress of Bamboo in Mexico in 2018 was very effective at expanding our network and knowledge. [At the Congress] We were invited as speakers to present our work ‘Bamboo, the wonder material to reinvent mobility’ and had the opportunity to expand our contacts with bamboo plantation owners, manufacturers and artisans across China, Colombia, India, Japan and Mexico. Now we are very busy building solid relationships with our partners. This form of partnership helps us to ensure and monitor the correct supply of the material in terms of sustainability, quality, cost and time. To achieve the best results we are partnering with experienced professionals and companies from all over the world, who can assist us with their expertise and knowledge. What do you think is the greatest difficulty in convincing the public that bamboo is such a great resource? The greatest difficulty is convincing the public or potential buyers that bamboo composites will not break down easily, that their lifecycle is very long and that this material is capable of withstanding various stresses, such as heavy water exposure. 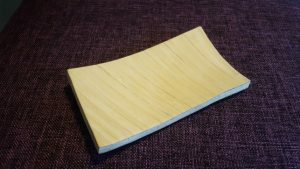 Also, many people worldwide see bamboo more as an artisan material for low- or medium-quality products; this perception also makes it difficult to promote it as a material with a very long lifespan. 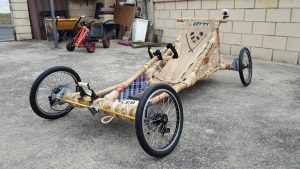 With our bamboo soapbox racer we demonstrated the high flexibility and resistance of bamboo, but now is the time to showcase the use of these materials in a real automotive example, with the same quality and safety standards as conventional vehicles. This will be a really difficult task, but once the proof of concept is released and presented to the public, we believe it will become a game changer. Interview by Ann-Cathrin Joest for INBAR. Ivan Platas Martínez’s article ‘Plastic, metal or wood. Could finite materials be replaced by sustainable ones?’ is available on LinkedIn.